A few weeks ago, I was doing a day of sustained silent reading with my students. 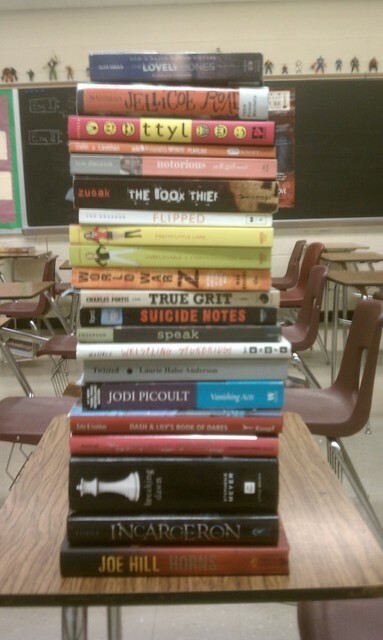 At the end of the period, on a lark, I took snapshots of what the class was reading with my digital camera. I thought sharing the diverse reading tastes of my students might make for an interesting blog post at some point. If you’re interested in helping to add to our library, DonorsChoose is the place to do that- I have several projects up and ready for funding right now… most of them are currently “Almost Home” funded, meaning it’s even easier to bring new books to eager readers. This picture comes from a 9th grade Advanced English class. You are currently browsing the archives for the a collection of books category.